As a professional bike builder you have all sorts of people walk through your door, from the serious customer, to the young lad that wants a custom Ducati for no more than five grand. 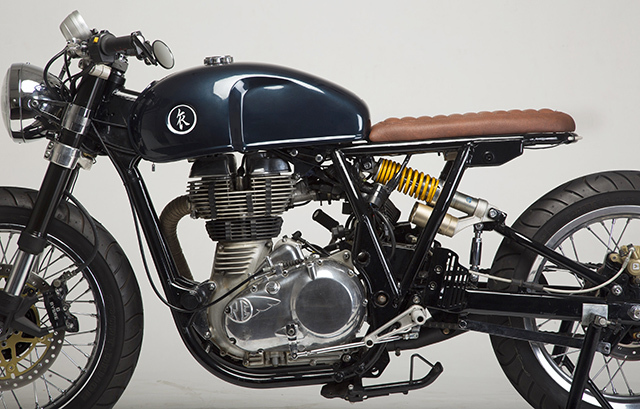 For Krish Rajan of KR Customs there was a different client to please, his “Lady Love” Loopy who had seen the bikes he’d created and while impressed with the quality wanted something, with “beauty and elegance”. Oh and Krish not one of those “adrenaline filled, tough, macho machines!” you usually build. Many a mere mortal would be losing their hair at the thought of such a demand but with a Masters in Applied Math, an IT expert by day and the owner of Chennai’s premier custom bike shop in his spare time, Krish is a man who gets it done and keeping his partner happy is always a challenge he is willing to accept. 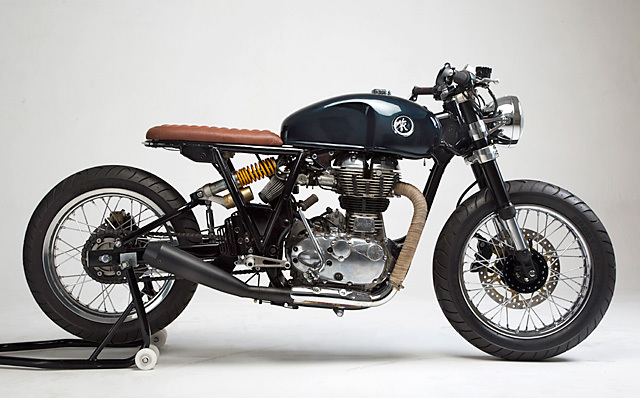 This Royal Enfield Continental GT Cafe Racer might have been the star of the main stage at India’s 2016 Bike Week, but the real prize was winning Loopy’s heart. 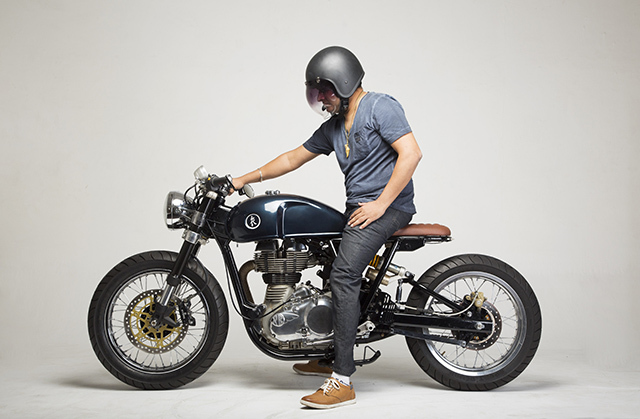 In setting up KR Customs Krish didn’t cut any corners, the business came about after he decided if he was going to build his own bikes he’d may as well own a custom shop and employed a Father and Son team with more than 35 years experience in repairing Enfields to ensure the mechanicals of his builds would always be spot on. The right equipment was acquired, including everything you need to machine custom parts, welding and repair equipment and even a frame jig was setup. But unlike their previous builds KR left the jig alone and made the decision to utilise a low km 2015 Continental GT that Krish’s cousin had for sale as the foundation for their creation. 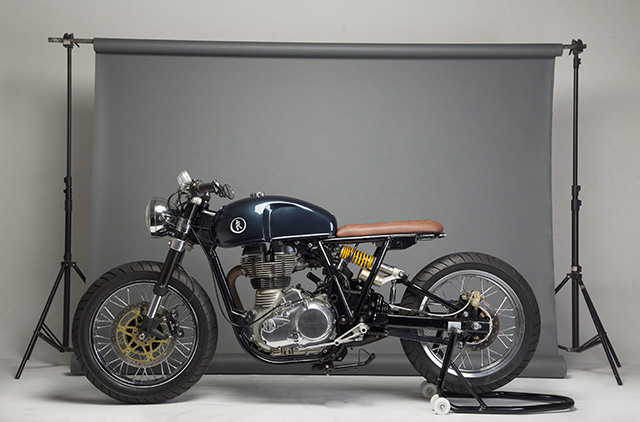 Despite it being all but brand new the bike was stripped to its bare frame were it sat while Krish stood back and gazed at it trying to draw inspiration for the build. There he stood and stood, hours ticked by but nothing came to mind until he was flicking through some photos of an Italian bike show and noticed the rear suspension setup on an old Vincent Black Shadow. The build would begin with the rear suspension and simply let the ideas flow organically from there and he and the team set about creating a twin mono-shock setup. 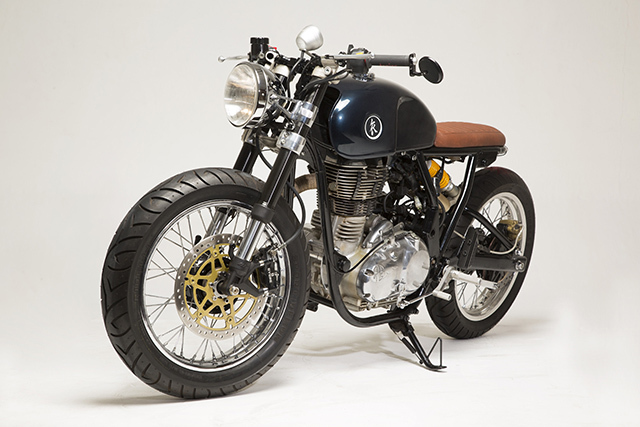 The first decision to make was what shocks to use which would determine the length of the new wheel base, instead of going for a pair of off the shelf sportsbike units Krish made the wise decision to instead use the stock Pioli shocks from the original twin shock arrangement as they were already designed to handle the weight and geometry of the Enfield. The shocks were shortened as they now operate closer to the centre of the bike and no less than six swingarm hoops were made until KR were totally satisfied with the result. What they ended up with is a twin mono-shock setup with 4 inches over standard swingarm length and a 3-point pivot system that acts as a height adjustable linkage. It is one of the things that you just have to love about India, the imagination is limitless and the ingenuity to make it happen with a never give up attitude. 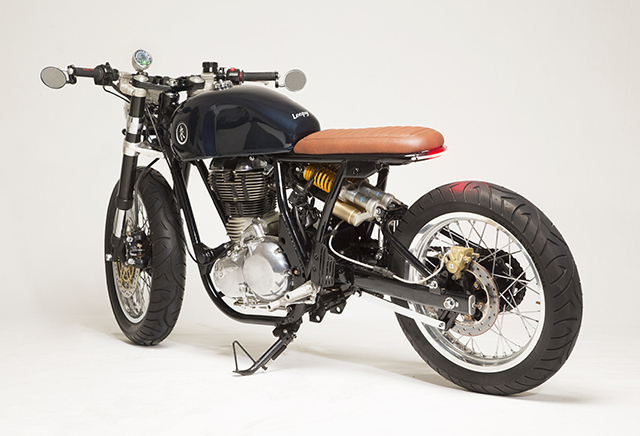 Continuing with moving from the back to the front the next item tackled was the seat and Krish had in mind a simple and traditional Cafe Racer treatment. 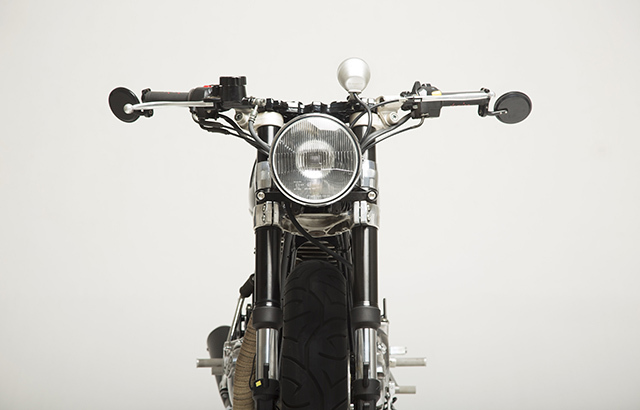 The subframe was heavily cut back to shorten the lengthy standard item and to also accentuate the longer swingarm. 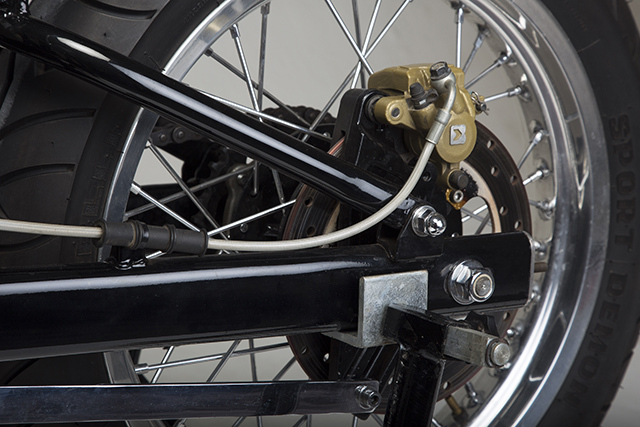 A rear hoop was welded in place and is supported by the twin shock mounts that are deliberately left in place for extra strength. Knowing the colour Loopy would love, the seat base was sent off to a local leather worker who stitched up a vintage look piece in a fitting tan hide. From here the decision was made to ditch the standard fuel tank but doing so on a fuel injected motorcycle is not so simple with the need to consider the in-tank pump and accessories. 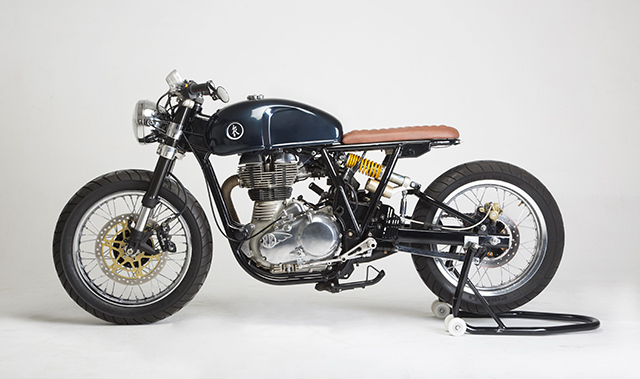 What Krish came up with was his own take on the famous Benelli Mojave tank that he calls the “Bulaga” with a hump built into it to take the fuel pump and shortened to fit snugly on the Enfield frame. Finished in a deep midnight blue the stunning colour comes to life in the hot Indian sun and sports KR Custom logos in the badge rings and hand painted “Loopy” lettering. So far the back to front design approach was working perfectly and with such a unique rear shock setup it would have been criminal to leave the front end standard. With the main KTM Duke 200 assembly plant in India, Krish immediately thought of their inverted forks as the perfect swap for his Cafe Enfield and with the right bearings fitted into the frame the WP units were bolted into place. The lower triple tree has been metal polished to give a brushed look while the upper item is finished in hard-wearing black. 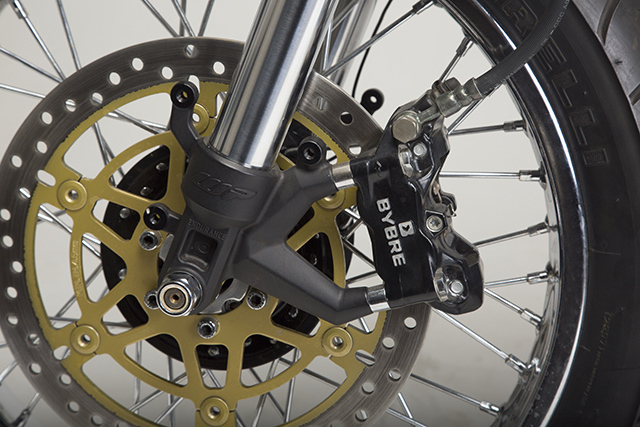 The KTM also leant its BYBRE two pot caliper that utilises custom machined spacers to grab the RE’s 300mm floating disc. To power the new brake combo a Yamaha master cylinder has been fitted to the Tarozzi clip-ons that are mounted at a less aggressive angle for easier steering. 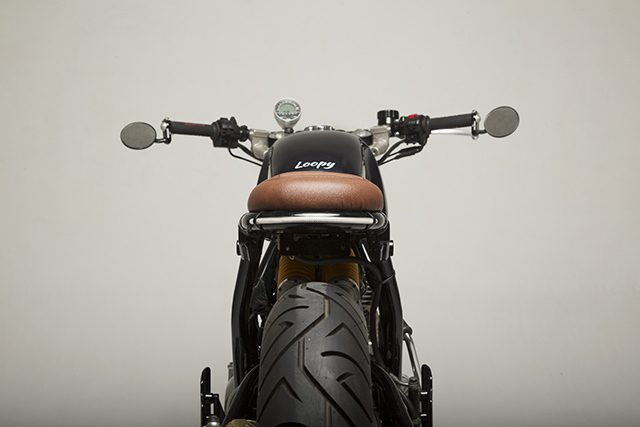 The grips are from Domino with new switch gear, bar end mirrors and a single Acewell speedo for the timeless Cafe Racer look. To keep that theme going Krish felt the standard headlight would work perfectly but the addition of USD forks required a set of custom-made brackets to support it. Out back a single LED strip takes care of the tail light and turn signals with the front indicators coming in the form of tiny lights mounted just under the headlight for an ultra clean look. Back to the Tarozzi catalogue and the clunky standard foot controls were shown the door in favour of Italian milled units. The 535cc single cylinder engine remains relatively standard and is a more than capable mill but so that everyone can hear Loopy coming KR fabricated a custom reverse cone muffler in black specifically for the build. To give his little lady a more aggressive look without being too masculine and to ensure she had the best rubber underneath her Krish fitted up a set of Pirelli Sports Demon Rubber with a 120 front and 130 section rear for crisp road holding. All up it took the team at KR Customs 4 months to complete the build and many of the parts were sourced from the USA by Krish’s IT colleagues on work trips filling their suitcases; even the boss got involved. It might have made for some curious looks at the customs desk but in the end the result that was always intended was achieved. Loopy loves her Cafe Racer and couldn’t have been more satisfied and as they say happy wife, happy life!